Grand Rapids Press File PhotoThese runners in Riverside Park could eventually follow a path leading to downtown Grand Rapids. 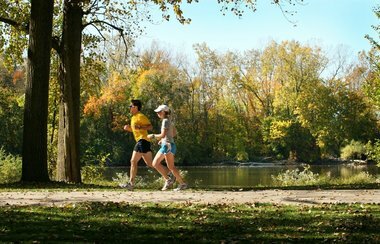 GRAND RAPIDS â The city and state are in the process of purchasing more than one mile of riverfront railroad property that eventually will lead to a bicycle and pedestrian trail that links the downtown area and Riverside Park. Despite 1st Ward Commissioner Walt Gutowski’s doubts about spending that much for “swamp land,” the City Commission’s Fiscal Committee today approved a $168,800 outlay to match more than $2 million in state and federal funds for the purchase. The property is the final piece of a corridor that will eventually connect 245 miles of trails that include the Fred Meijer White Pine Trail State Park, the Musketawa State Trail, the Fred Meijer Berry Junction Trail, the Hart-Montague Bicycle Trail State Park and Pere Marquette State Trail. 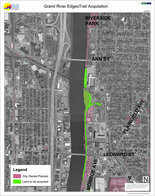 Finding the funds to build a trail that connects Canal Street Park and Riverside Park will be the next challenge, Steffen said. The 12-acre site includes a 3-acre woods that will provide additional public access to the river and floodplain protection, Steffen said. The owners of the defunct railroad property originally wanted more than $6 million for the property before reaching a $2.2 million price with the Michigan Department of Natural Resources, Steffen said. The state agency will own the property while the city will maintain and operate the trails. “I don;t think we can pass on this, but we are talking about swamp land that is very valuable,” Gutowski said. “I think this is an opportunity we’re not going to get again,” said 2nd Ward Commissioner Ruth Kelly. In addition to the city’s $168,000, the purchase is being funded by an $850,000 grant from the state;s Natural Resources Trust Fund and $1.2 million from a federal fund through the state Department of Transportation. The North Monroe Tax Increment Finance Authority also is pitching in $31,185.